This Site, together with its content, data, information, software and services, is provided by The UK Sponsorship Awards Ltd, a company registered in England as detailed on the Contacts page. The UK Sponsorship Awards Ltd (UKSA) either owns or is licensed to use the copyright in the data, table, graphic, editorial or other content of its website pages. Unless agreed, you may not post, publish, transmit, distribute or otherwise use software or material derived from the website. The UK Sponsorship Awards Ltd makes every effort to ensure that the information published is accurate. However, the UKSA cannot accept any liability for the accuracy of its content. Users who rely on the information do so at their own risk. No warranties of any kind are offered. 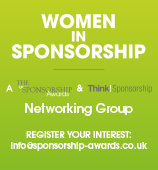 The UK Sponsorship Award Ltd includes links to third party organisations. The UK Sponsorship Awards Ltd has no responsibility or liability for the accuracy or content of these sites. From time to time, we collect and retain personal information which is used to provide Services relating to the Hollis Sponsorship Awards and Hollis Sponsorship Bulletin. This information will be stored with appropriate care and security and will be handled in accordance with the Data Protection Act 1998. The Hollis Sponsorship Awards are administered by The UK Sponsorship Awards Ltd.
All entrants must abide by the criteria set out in this website. No refunds on payments made for entries will be permitted once the entry is submitted and uploaded. Entrants can, however, request for their entries to be withdrawn. All payments for entries must be cleared by February 9th 2010 in order to go forward for judging. Cancellations for bookings for the Hollis Sponsorship Awards Dinner will only be permitted if requested one month in advance of the event. A 20% administration charge will be levied. Tickets will be issued once payment is received.